Check out this early Power Point Presentation of my Master of Design Proposal from my research design class ’06 with Dr. Steven A. Moore. The link above should download a .pdf. 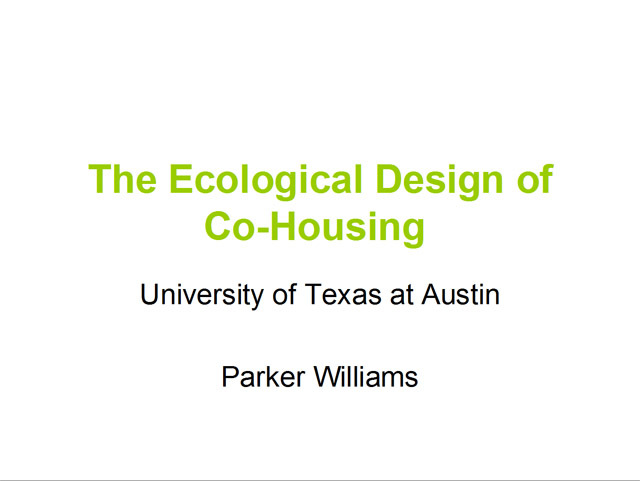 Purpose of Research: The aim of this design study is to propose a specific case of co-housing that expands the term to mean cooperative dwellings of human and non-human residents, creating a greater ecological place.This design of co-housing should appropriated to the site as to minimize environmental damage and to enhance what characteristics, qualities and species/beings are present and what could be present (i.e. introducing native speicies, creating architecture that improves the quality of life of future residents). + I see a need to integrate the human environment and nature in development. + Far too often nature is seen as stopping development, how can this be changed? + Concepts of housing like Co-housing are more sustainable and can give residents more control in their built environment. Create more sustainable housing, reflecting and embracing nature can bring inspiration and more livelihood. Benefits of intertwining nature and human development can be better understood.